This month I am looking at the 3 wands. This card is a personal favourite of mine and for me in readings for myself it often represents my family. The 3’s are the creation of 2 into a third Kabbalistically we have the separation from oneness (aces) to the 2’s and then in the 3’s the 2 come together and create offspring – a third. So all the 3’s are connected with creative principles in some form. Chokmah – the idea (2’s), is built upon in Binah(3’s). Something is manifest from a thought. 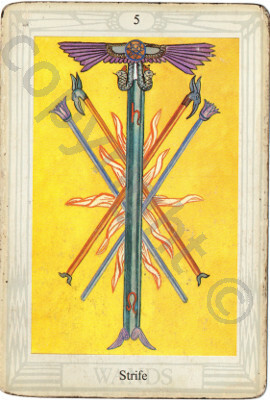 In the suit of wands we also have the concept of passion, spirituality and raw energy. So 3 wands is also related to creating something of great meaning. In the Thoth it is linked to Sun in Aries. Sun in Aries is a very active sign – there is lots of energy and passion to get things done and make things happen. there is also a good deal of leadership power. An Aries character can be related to a youthful warrior, perhaps a little over keen at times, but strong and courageous and able to forge ahead fearlessly even in the face of opposition. Aires is also a representation of the beginning of spring. We have the culmination of personal power in 2 wands being acted upon and bring forth new life in the 3 wands. According to Snuffin the lotus wand is associated with Isis and symbolises the power of creation. It can also be seen as a magickal tool used in creative magick, to bring forth our will into the physical reality. So this card is a very creative card and in a wide sense, not simply self expression but the bringing into being of many different types of things, I often see this as the creation of something in the workplace that you have great enthusiasm for. It can come through the partnership of a few people too, rather than simply a sole endeavour. This month I picked a card to work with for these Thoth tips and came up 5 wands – strife. Sometimes people see this card as being a hard card to work with – indicating stresses and strains and general difficulties in making things work as they wish. It can indicate conflict with others and with the situation in general. However it is a card which also indicates that the effort expended is worthwhile. The intense, clear yellow, reminiscent of the sun, in an indication of self-esteem being the background of the effort expended. The wands themselves have behind them the motivation of flames of passion and energy to move things forward despite the difficulty. This can apply to both business situations and also personal relations. The 4 wands preceding the 5 is in balance and now the energy builds and needs to face conflict next to create the changes needed to achieve the overall goals being worked for. This can be likened to breaking out of the old ways of success and facing new challenges to keep business projects afloat. It can also be the stage of a relationship where you have decided that the relationship is good and worth investment in time and energy, however the honeymoon period is just over and with the areas of commonality fully explored – now the territory of how you are different from each other is broached. This brings conflict, but also respect as you gain a measure of each others integrity and ability to hold their own. You also work out the ways you can deal with the conflicts between you that enables both parties to be both respected and also honoured in their individuality as well as in your togetherness. 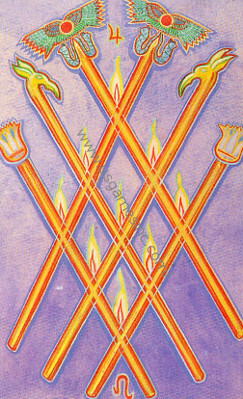 The phoenix heads on the ends of two of the wands indicates the ability to come through this time of conflict renewed and refreshed, the lotus’ on the other two wands indicates the love that is still there and influencing the conflict as it arises, for love is within conflict as well as within peace. The main wand has upon it a symbol of the sun and the guiding principle of self-esteem, personal self value and from here value of others as individuals with their own perspectives. You hold your own, discipline yourself, and work with the conflict rather than run from it. The efforts expended with this card can be compared to training for a sporting achievement, the effort required needs discipline and the building of stamina, the competition – or conflict – is what enables, or rather sparks, the growth to take place. It is the striving for the highest outcome in a situation and being prepared to go through personal difficulty to achieve it whilst also holding true to ones own values and respecting ones limitations. A card that can bring powerful growth and success. This is a wonderful card of success, usually after a time of struggle and effort. The 6’s in the Thoth relate to the Tiphareth point on the Qabbala. This is the point at which spiritual forces come to earth – it is the messiah node so to speak and so the 6’s in each suit are the most perfect point of that suits energy. Here we have the suit of wands and so are dealing with the realm of spirituality, passion, life force, creativity and the like. This perfection can not be made without effort, even if the picture is painted effortlessly it is the years of experience of painting, drawing and looking that goes into make that effortless creation. In the same way this card expresses a perfection coming forth after much experience and work. The wands have fire between their joins and it represents the stability and strength that comes with this victory. The phoenix heads are the rebirth, the new that rises from the flames, the transformed and renewed state. There are also lotus wands and winged suns, the lotus wands can signify the love that runs through this success, love of a spiritual nature rather than of the romantic kind, love that runs through all good works. The winged suns the reference to spiritual self-love and how self-love also is an important quality for success to be true, as success is the external manifestation of the internal riches and wealth – we need to recognise and accept our inner wealth in order to manifest success on the material plane, and here with spiritual value too. Often when this card comes up it is the success of breaking an emotional pattern or healing an issue that was deep-rooted – so often relates to having completed one of our soul tasks in this lifetime. The card is ruled by Jupiter in Leo and so is also indicative of the success being very visible to the public (the leo pride and charisma) and in many ways furthering other people (Jupiter expansion of knowledge or spirit) and not just being of benefit to the individual, but also the wider sphere is affected by your success. Astrological associations can include liking for showyness, film, theater, socialising, confident leadership particularly with things helping others, religious activity with ritual, councilors, church leaders and other prominent figures can also be associated with this card.